In Kentucky, An Epic Senate Race Takes Shape : It's All Politics While GOP Sen. Mitch McConnell's strategy is to attack Democrat Alison Lundergan Grimes as a tool of her national party, she's seeking to put the senator on the defensive over women's issues. 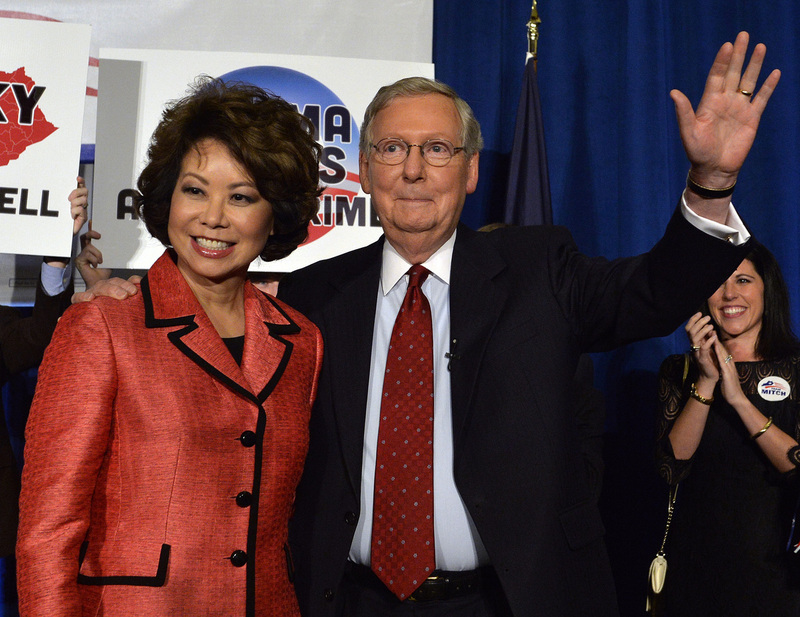 Sen. Mitch McConnell, R-Ky., and his wife, Elaine Chao, wave to supporters in Louisville following his GOP primary victory on Tuesday. It says something about Kentucky's Republican Senate primary that its most memorable aspect wasn't some fiery debate exchange between Sen. Mitch McConnell and challenger Matt Bevin, or any kind of clash like that. There was no debate. Instead, it was a weird viral Web video from the Senate minority leader's campaign that featured him smiling in different contexts. Naturally it was one endlessly mocked by late-night comedians and parodied on the Web — it also led to the coining of a new word: "McConnelling." On Tuesday, McConnell made short work of Bevin, his Tea Party-backed challenger. In honor of that famous Louisville native Muhammad Ali, let's just say McConnell knocked his opponent out in an early round before the Senate minority leader could even work up much of a sweat. Judging by the punches thrown in their respective primary-night victory speeches, McConnell's November fight against Alison Lundergan Grimes, who easily won the Democratic primary, looks like its going to be punishing. The contest is now tied according to a recent Bluegrass Poll. 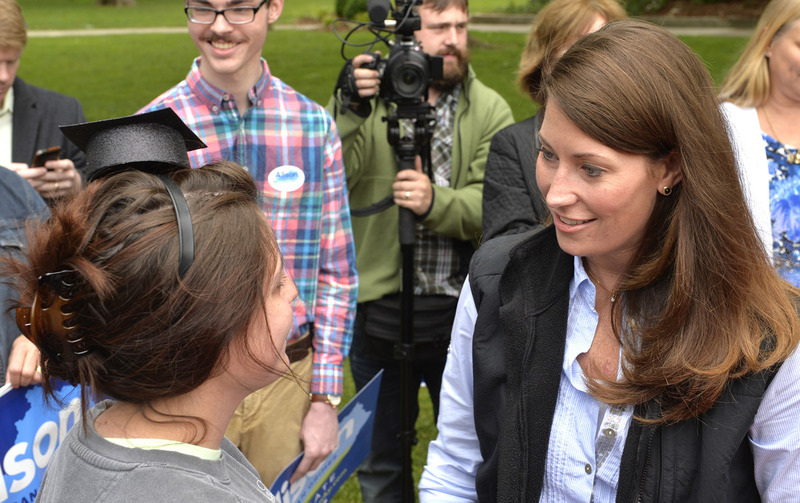 Alison Lundergan Grimes, the Democratic nominee for a Senate seat from Kentucky, talks with recent college graduate Lee Fowler during a May 17 campaign stop. "She's a partisan's partisan who has been practicing party politics since she learned to talk," McConnell said of Grimes. "I mean, let's be honest. Anyone who learned politics at the school of Jerry Lundergan will not be a model of bipartisanship." That signaled McConnell's intent to focus on more than just the question of Obama. He also plans to make the Democratic nominee's father an issue. Here's the subtext: Grimes' father faced legal trouble as a lawmaker, charged with violating state ethics laws. A conviction was later overturned. McConnell pointed putdown of Grimes' father ended any doubts that he and his allies planned to simply tie the Democratic nominee to Obama alone. For her part, Grimes stung like a bee in her victory speech. Staring straight into the camera and speaking directly to the incumbent, she put him on notice: "Sen. McConnell, this race is between you and me. That's the name that appears on the ballot. And as you said so many years ago, it is my No. 1 priority to make sure Mitch McConnell doesn't see another term." That was Grimes reminding voters of McConnell's October 2010 statement that his top goal was to make Obama a one-term president. He failed in that endeavor but inadvertently provided Democrats with words that inflame them still. In their speeches, both McConnell and Grimes laid out how they want voters to see their respective candidacies — and opponent. McConnell wants voters to view Grimes as a rubber stamp for Obama and Sen. Harry Reid, the majority leader. He also wants Kentucky voters to value his 30 years in the Senate, especially the fact that he's poised to become majority leader if Republicans can gain the six seats they need. And he wants them to view him as a necessary conservative counterweight to Obama during his last two years in office. Grimes, on the other hand, is trying to turn McConnell's long tenure in Washington into a liability. She accuses him of being out of touch with Kentucky voters and a servant of Washington lobbyists and money. She wants voters to see her as the new face of change who is independent of Obama, and also from the powerful and wealthy interests who hold sway in Washington. And she sought to connect with women by subtly framing some of McConnell's attacks as sexist. "I'm here to tell you tonight that I am not an empty dress, I am not a rubber stamp and I am not a cheerleader. I am a strong Kentucky woman who is an independent thinker ..."
When it comes to defining the opposition, polling suggests McConnell may have the easier time. Many Kentuckians still don't know much about Grimes. A recent NBC News/Marist poll found that 10 percent of voters had never heard of Grimes and 27 percent were unsure how they felt about her. Contrast that with just 1 percent of voters who had never heard of McConnell and 11 percent who were unsure. But familiarity in politics can breed low approval ratings, and McConnell must deal with those. A recent poll put his approval rating at around 30 percent. McConnell spent nearly $12 million to beat Bevin. For that, he wound up with the worst performance for an incumbent Kentucky senator in a primary in 76 years. Those have to be worrisome signs. As part of McConnell's strategy to define Grimes as bad for Kentucky's interests, his campaign has accused her of being part of a "war on coal." It's a potentially potent line in a state with an almost mythic tie to the fossil fuel — it still provides jobs in eastern Kentucky, though not nearly as many as it once did. "Kentucky cannot afford to empower the people who have been waging a war against jobs in this state for 5 1/2 years," McConnell said in his victory speech. Grimes actually agreed with McConnell that Obama is waging a war on coal — that's one way to create distance between her and the president in a state he lost twice and badly. But she tried to define McConnell as part of the problem, accusing him of doing little to defend coal during his tenure. "Let's get the record straight: It's on Mitch McConnell's watch, not mine, that we've lost thousands of coal jobs." While McConnell's strategy is to put Grimes on the defensive for her national party, Grimes sought to put the senator back on his heels on women's issues. A strong November turnout among female voters will be crucial if Grimes is to become the first Kentucky woman in the U.S. Senate. So Grimes is making issues like equal pay and a higher minimum wage central to her campaign platform. And she signaled that she plans to pummel McConnell for voting against renewing the Violence Against Women Act. Aware of his vulnerability on issues with strong appeal to female voters, McConnell made sure to have his wife, Elaine Chao, a Cabinet secretary in the George W. Bush administration, and other women on the stage. He spoke of the important roles the women in his life had played. The examples he offered of people hurt by the Affordable Care Act? They were women. While both candidates tried to sell themselves in their victory speeches as focused on Kentuckians, outside groups from both the progressive and the conservative camps clearly view the Senate seat as a major prize. One outside group, Kentuckians for Strong Leadership, attacked Grimes over coal and the ACA before the primary, and that was just a warm-up for attacks to come. Meanwhile, Senate Majority PAC and EMILY's List are expected to weigh in with significant money in coming months. Grimes will need all the help she can get as she goes up against the McConnell fundraising juggernaut. As of his most recent financial report, he had raised about $21.7 million, spent $11.4 million and had $10.1 million on hand, according to OpenSecrets.org. In other words, even after all his spending to date, McConnell still had more left in his campaign treasury than the $8.1 million Grimes has raised in total. Of that total, she had spent $3.2 million, leaving her with $4.9 million in cash. Democratic outside groups have apparently been keeping their powder dry for the head-to-head contest against McConnell — GOP outside spending has so far outpaced Democrats. All told, some think the Senate race in Kentucky could result in $100 million or more in campaign spending. Among the most interesting things to watch in Kentucky will be how the health care law plays out in the race. The ACA law is decidedly unpopular in Kentucky, according to the NBC/Marist poll, which found that 57 percent of registered voters viewed the law unfavorably. But the relative popularity of the state's Democratic Gov. Steve Beshear, who implemented the state's Kynect health exchange under the ACA, adds a variable. The NBC/Marist poll found a plurality of voters, 29 percent, favored Kynect while 21 percent opposed it. So Grimes has at least a path to defending herself against Republican health care attacks by praising Beshear for his handling of Kentucky's health exchange.